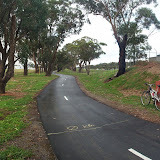 On Sunday morning I headed north to give it a thorough test along the bumpy Kananook Creek trail, through Carrum and on to Mordialloc (30 km). It was cold with some light rain, but the bike performed very well so I decided to catch a train to Werribee to ride the Federation Trail to Altona. Last I heard this trail was a bumpy with lots of loose gravel, but in it seems it has since been completely resurfaced and was quite smooth and clear of debris. Only the short section parallel to Hoppers Lane in Hoppers Crossing stuck out as being noticeably bumpier than the rest of the trail, being concreted and more like a footpath than a bike trail, but still nothing to complain about. It was probably just as well that it was a smooth ride – when I got back home I noticed a bolt connecting the rear suspension arm to the spring was loose. Oops. Werribee to Altona was about 35 km, so around 65 km total distance travelled.